Tesla recently unveiled their “ludicrous” Model X to near universal acclaim. Unfortunately, unless you’re a professional auto-reviewer, you aren’t likely to ever get behind the wheel. Despite a much publicized $80,000 price tag, most reviewers will admit that it will set you back at least $130,000. And until electric charging stations become more widespread, it’s not a very practical purchase. And with a certain German manufacturer that shall remain nameless cheating on their emissions standards, there’s really only one option for green drivers in 2015. A hybrid. And there’s one question all hybrid drivers ask eventually — how much does it cost to replace hybrid battery? Short answer? It depends on the make and model of your car, whether you have a warranty, and whether you can get credit or cash for recycling your used hybrid battery. How Much Does It Cost To Replace Hybrid Battery? Unfortunately, many hybrid drivers are shocked to discover that their local dealership is actually more likely to install a used or refurbished hybrid battery replacement rather than a newer, better battery. The reason most hybrid drivers don’t realize this? Because they get charged the price of a new battery. So before you stop by your dealership, consider alternatives for purchasing a replacement hybrid battery. In the United States, most hybrids come with an 8-year, 100,000 mile warranty to offset the cost of batteries for hybrid cars, with many states mandating even stricter battery warranties. But if you’re outside your warranty, or if you want to avoid getting a refurbished battery replacement, you can find independent dealers selling hybrid car batteries. We focus primarily on selling Honda hybrid batteries, and many Toyotas and more expensive hybrids have more expensive batteries. But in general, you can expect the cost of replacing a hybrid battery to set you back a few thousand dollars, which means it’s probably time to start budgeting once you start approaching the 6-year, 80,000 mile mark. So how much does it cost to replace hybrid batteries in Hondas? 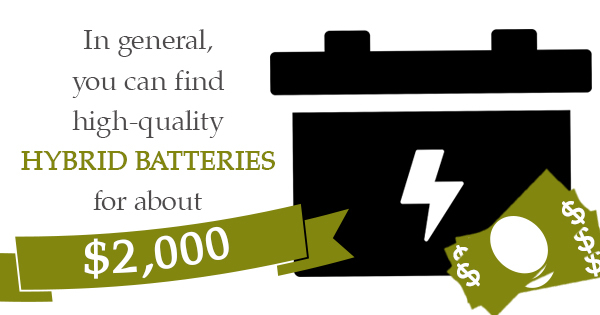 In general, you can find high-quality hybrid batteries for about $2,000. In many cases, that’s actually less than you would pay at a dealership for a lower-quality battery, and brand new power cells can improve the performance of your car for years to come. And with hybrids running 20-35% more fuel efficient than gas guzzlers, you can easily recoup those costs in the years to come.